With 7365 registered visitors from 67 countries, the FlowerTrials reports 2016 as a record year. The number of locations visited increased by 10% with 32,286 individual visits being registered, an average of almost 4.5 per person. As many locations host several breeders, the average number of companies visited per person is significantly higher. European visitors showed a considerable increase and there was an impressive surge in the interest from Asia, Canada and South America echoing the general trend that FlowerTrials is a key floricultural event worldwide. In The Netherlands, the Westland continues to attract the largest majority of visitors with 70% making the trip to this area. With 8 additional exhibitors, the Aalsmeer region saw its visiting numbers climbing by no less than 25%. In Germany, the Rheinland Westfalen region saw a spectacular 30% rise in the number of visitors. With all breeders now in closer proximity, this area has certainly become more attractive to visit. FlowerTrials exhibitors open their doors next year in week 24 from 13th to 16th June 2017. 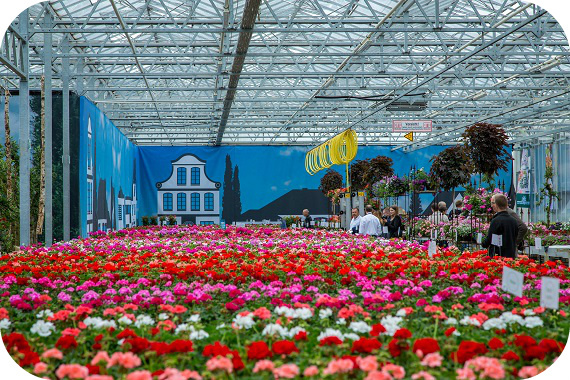 The FlowerTrials took place from 14th to 17th June in the Westland and Aalsmeer regions in the Netherlands, and Rheinland Westfalen region in Germany. Breeders show their latest innovations in pot and bedding plants to the international horticultural industry. A registration system with a personal badge scanned at the entrance of each location allows insights into the visitor profiles.